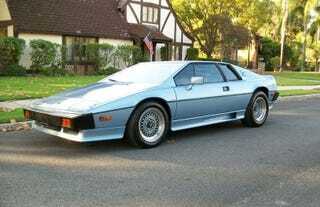 The Lotus Esprit is that marque's longest running model. Today's Nice Price or Crack Pipe turbo edition doesn't look long in the tooth but does its price make you long for it to be in your driveway? It's also been a long time since Toyota has built anything as wonderfully weird as the Previa, and that minivan's odd duck status has engendered a lot of affection for its egg-emulating badassity. That sweet van-boy love apparently was enough for yesterday's TRD-infused edition to overcome the Crack Pipe, and in a nail-biter of a vote it drove away with a RCH-close 51.34% Nice Price win. While that Toyota took the late eighties styling meme of organic roundness to almost cartoonish extremes, today's Lotus Esprit Turbo remains emblematic of the prior decade's dalliance with severe angularity. All kinds of car makers followed Volvo down the rabbit box, and in fact Volkswagen's own Rabbit stood in stark, boxy contrast to the precedent Beetles and Type IIIs. But nobody eschewed the French Curve with quite the veracity of the British. Whether it was a union mandate or just a revolt against the English Wheel, the Brits produced such fabulously flatly folded fare as the Aston Martin Lagonda, TVR Tasmin, and today's player, the Lotus Esprit, presented here in its especially angular S3 bodywork. This recently unearthed two-owner Turbo looks to be in amazing condition for being 26 year old. Loti are cars that you typically have to gauge the age of in dog years, and many of the ‘70s and ‘80s cars had the build quality that implied they were put together by mad dogs and Englishmen. That didn't stop them from multiple appearances as the ride of choice for Britain's least secret secret agent, however. In 1981's For Your Eyes Only, James Bond drove two Esprit Turbos, a white one which he blew up, and a copper-colored one fitted with an unfortunate ski rack. Since then, the Bond series has gone through three more actors, while this metallic blue Lotus still looks like it plans to die another day. And perhaps it is the un-dead as the seller makes the uncharacteristic claim here that everything works – even the A/C. Not only that, but with only 40,000 miles on its clock, he claims the engine runs strong, and isn't, as you might suspect, afflicted with seals that have shriveled to the consistency of a Shar Pei. That miraculously preserved engine is the wet-sump version of the 910 turbo. A derivation of the all-alloy twin-cam four that debuted in the Jensen Healey, it here displaces 2.2-litres and pumps out 210 horsepower, a sizable increase over the naturally aspirated engine's 172. Backing that up is a 5-speed gearbox that comes from Citroën, and car has a suspension that, by '85, had been heavily revised and featured more of Toyota than Triumph. A triumph is what could be used to describe the performance however, as this car should be good for clipping off zero to sixty runs at under six seconds a piece. The revised bodywork – big bumpers, louvers, skirts and spoilers – may have sullied the purity of Giugiaro's original vision, but it did help the car achieve a 150 mph top speed. This car's interior is complete, and seemingly original, with the exception of a later radio head unit. The leather is un-cracked but its texture and color gives the appearance of. . . well, are you familiar with the character Max Rebo from The Return of the Jedi? Like a freakish mélange of that movie and The Silence of the Lambs, this interior looks to have been made from the keyboard playing muppet. Creepy, I know. Along with the alien hide, this Esprit provides the ergonomics of a blind man's house, and seats that look about as comfortable as a dentist's chair. None of that is this car's fault, it was just how Lotus rolled back then. All that of course is part of the charm of the Esprit, and even more charming is that performance which for the ‘80s reached near super car level, and today should still prove highly entertaining. What does such entertainment cost, you ask? Well, this survivor Esprit has a Buy it Now of $17,500, although the seller notes that Californians will have to miss the show as the car hasn't received its clean bill of health from the CARB. Sorry hippies. You can bet that, no matter how nice of shape, the entry cost for any Lotus is only going to be the tip of the iceberg. But that just means you need to make the entry point as low as possible, right? So what do you think, is $17,500 low enough for this blue bullet? Or, does that price throw a wet blanket on your esprit de corps? eBay or go here if the ad disappears - like it will tonight.